Inclusion and equity are central to the approach of the Vanuatu Skills Partnership, which works towards enhancing the status of women and people with a disability. Partnerships, as the project name suggests, is a cornerstone of the Vanuatu Skills Partnership’s approach to disability inclusion. 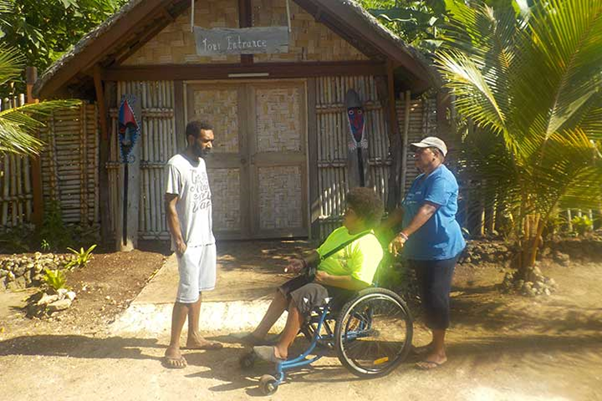 The project works in close association with Vanuatu’s Disabled People’s Organisation, Vanuatu Disability Promotion and Advocacy Association and Vanuatu’s main service provider, Vanuatu Society for People with Disability, as well as the Government of Vanuatu’s disability focal point, situated within the Ministry of Justice and Community Services. Freda Willie (middle) was the first Skills for Accessible Tourism Industry coach recruited by Vanuatu Skills Partnership. Photo credit: Vanuatu Skills Partnership. ‘This year, there has been a lot of positive results being received [and] we continue to support the women to enhance and grow their businesses, despite their health, financial and disability status,’ said Mr Yanhambath. Vanuatu Skills Partnership (formerly known as the Vanuatu Skills for Economic Growth Program and prior as the Vanuatu Technical and Vocational Education and Training Sector Strengthening Program) works with key productive sector departments to identify priority economic growth opportunities that can be maximised by targeted skills development through the Skills Centres. In collaboration with the Vanuatu Ministry of Education and Training, Tertiary Education Directorate and Vanuatu Qualifications Authority, the Vanuatu Skills Partnership supports increased diversity of training providers, courses and delivery modalities to increase flexibility within the skills system and promote pathways for further education. Pacific Women supports the Vanuatu Skills Partnership to provide training for women with a focus on tourism and agribusiness. Training includes individual coaching to women to improve business skills and increase their opportunities for paid employment.